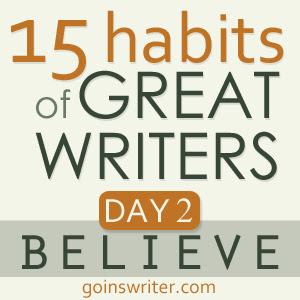 This is the second day of Jeff Goin's Great Writer's Series and today's challenge is: Believe. "Take some time to dwell on the fact that you are a writer. Meditate on it; let it sink in. Write about it, if you want. Do whatever it takes. The important part is you believe it. And just so you don’t think this is all esoteric, you’re going to do something radical. You’re going to get up two hours early and write." I balked when I read the last sentence of Jeff's e-mail. WHAAAAAAAAAAAAAAAAAAAT?! Get up two hours early?!!!!! I read his e-mail three times looking for a loophole and hoped he was theoretically speaking when he issued that challenge. I'm not a morning person and by that I mean my horns, fangs, and claws don't retract until after I throw back my cup of coffee. And even then it's iffy. I already felt as if I don't get enough sleep which is entirely my fault when I stay up late into the night editing photos. I kept my apprehension to myself knowing full well that I wouldn't receive empathy from anyone. Their answer would be so, don't do it. It's not mandatory like school. Why would you put yourself through that? True. But how would I continue doing life if I balked at every challenge that pushed me out of my comfort zone? What kind of example would I be to my granddaughter if she read this blog years from now and discovered her Gramma Nette allowed fear and unbelief to undermine the challenges I faced? Last month my sister embarked on her second trip to Italy in less than 6 months. On her first return trip from Italy she was sporting a Prada purse and asked if I'd like her to get one for me the next time she went. I wrinkled my nose. There is NOTHING in Prada that I would like. Nothing! I'm not the name-brand wearing kind of female and the thought of wearing anything Prada was horrifying. But my sister made a bet with me that I was 110% sure she'd lose. She vowed that she'd find something that I'd like and you know what?! She proved me wrong! This is the beautiful journal that caused me to lose the bet. For weeks I have stared at the journal and flipped through its blank pages. Although, I have my red Moleskin journal that I scrawl in almost daily I felt as if I could only anoint the pages of the Prada journal with profound words and not the meaningless dribble that passes for my emotions and musings. Not because it's a Prada but for the significant weight of thoughtfulness that my sister put into bringing it back. On this second day of the writer's challenge I'm going wake up early (someone pray for me) to fill the Prada journal with words of belief not just in myself as a writer but in EVERY aspect of my life.